To Cite: Shaweno T, Getnet M, Fikru C. Survival Status and Predictors of Loss to Follow-up Among Adult Patients with Tuberculosis in Public Health Facilities of Sheka Zone, South-West Ethiopia: Facility-Based, Retrospective Cohort Study, Middle East J Rehabil Health Stud. Online ahead of Print ; 6(1):e84068. doi: 10.5812/mejrh.84068. Background: Treatment success rate and loss to follow-up (LTFU) in patient with tuberculosis (TB) are a great concern in Ethiopia. However, available information is inadequate to assess the magnitude of LTFU and its predictors in geographically remote regions of Ethiopia. Objectives: The current study aimed at assessing the survival status and predictors of LTFU among adult patients with tuberculosis registered in TB treatment and care center in public health institutions of Sheka Zone, South-West Ethiopia. Methods: A facility-based, retrospective cohort study was conducted from 01 to 30 August 2016. The LTFU was defined as patient with tuberculosis under follow-up being lost before treatment initiation or treatment interruption for two or more successive months. Kaplan-Meir curve and Cox proportional hazard model were fitted to determine survival time and predictors with survival status, respectively. Results: A total of 1319 patients with tuberculosis were followed up for a total of 7056.87 months from treatment initiation to outcomes. Of these, 117 (8.9%) patients were lost. The survival status at the completion of the intensive and continuation phases was 93.7% and 90%, respectively. Living farther than 10 Km away from the nearest health facility (adjusted odds ratio (AHR) = 4.9, 95% confidence interval (CI): 3.02 - 12.50) and not being adhered to anti-retroviral therapy (AHR = 5.3, 95%CI: 1.63 - 8.12) were significantly associated with LTFU. Conclusions: Significant TB patient LTFU was observed during the first two months of treatment and care. LTFU was high in patients not adhered to antiretroviral therapy (ART) and living far. Although effective treatment is available for years, tuberculosis (TB) is still a foremost global health problem (1). By 2016, about 10.4 million novel cases and 1.5 million life losses were attributable to TB (1, 2). Despite being the home for around 25% of universally registered cases of TB, sub-Saharan Africa carries a much exceeding share of TB related deaths (40%), TB/HIV co-infections (72%), and TB/HIV deaths (80%); and relatively lowered coverage and worth of TB prevention, care, and treatment programs in Africa are among the many reasons for it (3). Developing countries have a share of 95% of cases and 99% of deaths (4). Ethiopia with 22 high TB burden countries, accounts for nearly 80% of all worldwide TB load and is ranked the 10th globally and the 4th in Africa (1, 2, 5). There were an estimated 30000 mortalities per year and higher than 80 TB-related deaths daily, excluding HIV-related deaths in Ethiopia during the same period (6, 7). Furthermore, Ethiopia is among the 27 countries with high burdens of multidrug-resistant TB (MDR-TB). According to the findings of a recent meta-analysis, the estimate of MDR-TB among new and previously treated patients was 2% and 15%, respectively (8). Although the rural part of Ethiopia shares about 85% of TB cases, the treatment outcomes of TB in physically inaccessible areas remain undescribed (9). Prior studies on TB in Ethiopia frequently focused on areas closer to major capital cities (10-12). To scale up TB prevention and control, the World Health Organization (WHO) recommends the directly observed treatment short-course (DOTS) strategy (13), and Ethiopia adopted this since 1991 (14). Accordingly, 92% of public hospitals and health centers in Ethiopia offer DOTS (15). The follow-up and care of patients with TB are based on the diagnosis and link of patients to DOTS clinics and start treatment after classification of TB into one of the therapeutic categories. Patients receive a combination of drugs for six to eight months based on the national TB treatment guidelines. The final outcomes of the TB treatments are classified as cured, treatment completed, treatment failure, died, defaulters, and transferred out. The loss to follow-up (LTFU) patients with TB is fraught with problems, predominantly due to MDR-TB (16-18). The LTFU is defined as patient with TP being under follow-up lost before treatment initiation or treatment was interrupted for two or more successive months. Incomplete treatment poses a substantial public health threat by disease recurrence, increased transmission, and development of resistance to drugs (19). Despite the widespread DOTS services and the increased participation of health extension workers (HEWs) in TB prevention and control programs, the patients are still failing to complete their treatment to declare treatment complete or cure (20, 21). Following the 2017 WHO report, patients with substantial TB that failed after a number of treatments; a variety of them reverted and became re-treatment after completion, and others developed MDR-TB among re-treated cases (22). Partly, the underlying reason was due to the ones lost to follow-up among cases with TB. LTFU is defined as a patient with TB that did not start treatment or whose treatment was interrupted for two or more subsequent months (23). A better knowledge of the time when patients with TB are LTFU and factors associated with it are the cornerstones to design time relevant intervention strategies. Therefore, the current study aimed at identifying the time when patient LTFU occur and investigating the associated factors during TB treatment to reduce the burden of LTFU during TB treatment. A facility-based, retrospective cohort study was conducted on cases with TB enrolled for TB follow-up from 21 September 2008 to 11 August 2015 in Sheka Zone, Ethiopia, located at 695 km away from the capital city, Addis Ababa. The study catchment was 13 public health facilities, of which only seven health centers and one general hospital had functional laboratories for TB sputum smear microscopy during the study period and none was reported of having X-ray or culture facilities. Diagnosis and treatment of TB were based on Ethiopian National Treatment guidelines (24); accordingly, patients with symptoms suggestive of pulmonary TB were considered smear-positive if at least 2 of 3 sputum samples were smear-positive. Cases with negative sputum smears not responding to treatment with broad-spectrum antibiotics were taken as smear-negative pulmonary TB (25), although the diagnosis of smear-negative and extra pulmonary cases also encompasses clinical judgement. All 1319 patients with TB recorded for TB treatment from 21 September 2008 to 11 August 2015 in Sheka Zone, Ethiopia were included into the study. The major outcome variable was survival status until a LTFU. In the current study, time until LTFU was defined as the time between enrollment to the service and LTFU. LTFU was considered when the patient was lost before initiation or treatment was interrupted for two or more consecutive months. Records of patients registered for TB follow-up from 21 September 2008 to 11 August 2015 were reviewed to identify the ones that failed to keep scheduled appointments for more than 60 days. Death was considered as the death of people on follow-up in the reporting period due to any causes. A patient was considered cured when he was initially smear-positive and smear-negative during the last month of treatment or on at least one preceding occasion. Similarly, a patient that completed a full course of TB treatment, but did not have sputum that was smear-negative for acid fast bacilli during the last month of treatment was considered treatment completer. Failure was declared when a patient was primarily smeared positive and remained smear-positive at the month five or later throughout treatment. Transferred patient was the case transferred to another reporting unit and the treatment outcome was not determined. All patients treated for TB according to the national TB treatment guidelines from 2008 to 2015 and registered in the TB registry log book with known treatment outcomes were included in the study. On the other hand, the patients with unregistered treatment outcome were excluded from the study. Data extraction tools were obtained from WHO, national treatment guidelines for TB treatment, and other similar studies (4, 6, 13, 26, 27). Data were transferred to Epi-Data 3.1, and exported to SPSS version 23 for analysis. LTFU rates were calculated by summing the number of patients with the event LTFU throughout the follow-up time divided by a total number of months of follow-up. Survival experiences of patients with TB separated by significant predictor variables at treatment initiation were compared using the Kaplan-Meier survival table. The incidence density for LTFUs was calculated using person months, and days of contribution to the cohort. Variables with incomplete data were entered as “missing” and the rate of missing data for all variables was below 1.2%. Descriptive statistics were used to describe the frequency, percentage, median, mean, and standard deviation of the study variables. Cox proportional hazards and log-linear model were used to estimate the strength of predictor variables with survival status of patients with TB on the treatment. Variables with P < 0.25 in the bivariate analysis were included in a multivariate model. The assumption of proportional hazards was checked using Schoenfeld residuals. A 95% confidence interval (CI) and P-value of < 0.05 for multivariate analysis was considered statistically significant. From a total of 1452 patients with TB registered in seven public health centers and one general hospital, 133 patients were excluded due to undocumented follow-up outcomes. The rest of 1319 patients with TB were included in the study by fulfilling the inclusion criteria. The mean ± standard deviation (SD) of participants age was 34.24 ± 12.8 years and the median age was 30 (interquartile range (IQR), 22 - 43) (Table 1). Abbreviations: ART, antiretroviral therapy; CPT, cotrimoxazole prophylaxis therapy; HIV, human immunodeficiency virus; TB, tuberculosis. A total of 1319 patients were followed up for a total of 211706 days (7056.87 months) with a median follow-up time of 169 days (IQR, 167 - 170) in TB treatment and care from 2008 to 2015. The minimum and maximum follow-up time was 0 and 626 days, respectively. At the end of observation period, of the total TB cases registered in TB treatment and care center 327 (24.8%) were cured, 732 (55.5%) completed treatment, 37 (2.8%) died, three (0.2%) failed treatment, 117 (8.9%) were LTFU, and 103 (7.8%) were transferred to another health facility (Table 2). From the overall LTFUs, the majority of 80 (68.4%) cases occurred during the intensive phase and grew up to 112 (95.7%) at the end of six months observation period (Table 3). Abbreviations: LTFU, loss to follow-up. The survival status at the completion of the intensive and continuation phases was 93.7% and 90%, respectively. The total mean and the median follow-up time were 23.8 and 28 months, respectively. The mean estimate of LTFU time for patients with TB that came from a distance of 10 km or less was 19.07 months (95%CI: 18.2 - 19.90), whereas for cases with TB that were residents within the health facility accessibility of greater than 10 km was 11.47 months (95%CI: 8.87 - 14.03). The observed survival time differences between these two categories of patients were statistically significant by log rank test (P < 0.001) (Figure 2A). Likewise, the mean estimate of survival time for patients with TB adhered to anti-retroviral therapy (ART) was 15.87 months (95%CI: 14.87 - 16.87), whereas for patients that did not start on ART care it was 6.03 months (95%CI: 5.12 - 6.93). The variation in survival time across the two different categories of ART status showed statistical significance (P < 0.001) (Table 4). Abbreviations: ART, anti-retroviral therapy; LTFU, loss to follow-up. During bivariate analysis age, gender, distance from the public health facility, type of TB infection, type of anti-TB drug during the continuation phase, and ART linkage status were included in the final model. By the application of multivariate Cox regression analysis, two variables were significantly associated with survival status of patients with TB including distance from the public health facility (AOR = 4.9, 95%CI = [3.02 - 12.5], P < 0.001) and status of start on ART (AOR = 5.3, 95%CI = [1.63 - 8.12], P = 0.006) (Table 5). Abbreviations: AHR, adjusted hazard ratio; ART, anti-retroviral therapy; CI: confidence interval; EH, ethambutol; km, kilometer; TB, tuberculosis. To attain WHO’s end TB strategy by 2030, retention of patients with TB on TB treatment and care is emphasized (2). The treatment success rate in the current study was 5% lower compared with that of WHO 2017 (2, 28). Similarly, it was 6% and 9% lower compared with those of other studies in central and north Ethiopia (29, 30) and Kolla Diba Health Center (31), respectively. This variation in TB treatment success rate might be due to the difference in access to a health facility and lack of close monitoring for defaulters in the study area. Similarly, the treatment completion rate was 16% lower compared with that of the study conducted in Dangila, Ethiopia (28). This variation might indicate the absence/low functioning of the health extension workers in tracing defaulting patients with TB during their follow-up period. Interestingly, a study in Tigray (30) reported a vastly higher cure rate compared with that of the current study. This vast variation was due to the study in Tigray including only the cases with smear-positive pulmonary TB. Although the current study showed a fluctuation in the treatment success rate throughout the follow-up period covered by the study, an increment in treatment success rate was detected. This can suggest that the DOTS program might be effective by improving the treatment success rate. This result was also similar to those of the 2017 WHO report and (2) findings from China (32). Likewise, there was a study from Azezo Health Center, which revealed the improvement in treatment success rate from 74% to 88% during 2008 to 2011 (33). The LTFU rate of patients with TB recorded in the current study (8.9%) was lower than those of other studies in different parts of the world including 13.5% reported from Jimma University Hospital, Ethiopia (1), 9.5% Zimbabwe (34), 9.9% Ukraine (35), and 30.2% Morocco (27). However, the prevalence of LTFU was higher compared with those of other studies, 0.2% from Dangila (28), 6.7% national reports (36), 4.2% from Cameroon (37), and 7.2% South Africa (38). This could be justified by the variations in study design, patient follow-ups, and definitions of LTFU. Unlike the current study, which defined patient LTFU as patients with TB with interrupted treatment for ≥2 subsequent months or patients lost before initiation, the other studies conducted in different settings (39) defined LTFU as patients with TB that interrupted treatment for ≥2 consecutive months. With regard to the incidence of TB LTFU, the majority (68.4%) occurred during the intensive phase and grew up to 112 (95.7%) at the end of six months observation period. This finding was higher compared with those of other studies, by 17% at the end of six months (1), and by 14% (32% during intensive, 22% during continuous). As well, survival probabilities at the end of the intensive and the continuation phases were 93.7% and 90%, respectively. The overall median and mean survival time of patients during TB treatment was 28 and 23.8 months, respectively. The survival probability in this finding was 3% higher both in intensive and continuous phases compared with those of a study conducted in India (40), in which 96% and 93% survival rates recorded at the end of intensive and continuous phases, respectively. This difference might be due to poor tracking and monitoring of defaulting patients detected during the early periods of treatment. The median time running from patient registration to onset of LTFU was short. This may be due to the delay in presentation to care and diagnosis of patients with TB that lead to advanced disease, or it may be due to the intolerance to a drug that resulted in early TB LTFU. This result was similar to that of the study in Thailand (41). Over two-thirds of TB/HIV co-infected patients (70%) not adhered to ART during enrolment in TB clinic were LTFU compared with about 39% LTFU reported among the ones adhered to ART at enrolment. This finding was consistent with other similar studies in which co-infected patients receiving ART were 40% less likely to default TB treatment compared with the ones with unidentified ART status (38). Similarly, the protective effect of receiving ART on defaulting in TB/HIV co-infected patients was promising (42-44). In the current study, patients living > 10 km from the center had a higher risk of early LTFU when compared with the ones living within 10 km. The current study findings were in line with the finding from Uganda and Ethiopia (45, 46). It was also found that the risk of treatment of non-adherence was higher among patients living > 10 km from the facility due to economic constrains to back transportation costs. Similarly, a study from the Philippines indicated that patients living near the service area were retained more on care as compared with the ones living far (47). Significant LTFU of patients with TB happened during the first two months of TB follow-up. In addition, there was a significantly higher retention possibility in patients with TB adhered to ART and living near the service area. Strengthening the DOTS program, especially during the intensive phase of treatment, and tracking defaulters are extremely recommended. The current study protocol was approved by Health Sciences Human Ethics Subcommittee of the Melbourne University, Melbourne, VIC, Australia, and Zonal Health Department, Sheka Zone, Masha, Ethiopia also consented for data extraction. Authors hereby wish to thank Sheka Zone Health Department and health centers for permission to access the data. Authors' Contribution: Tamirat Shaweno: Designing the study design, and formulating the research question, coordinating the data collection, analyzing the data, and drafting of the manuscript. Tamirat Shaweno, Masrie Getnet, and Chaltu Fikru: Analyzing the data, reviewing the manuscript for intellectual content, and reading and approving the final copy of manuscript. Ethical Considerations: The study was approved by the Melbourne University Health Sciences Human Ethics Subcommittee, Melbourne, VIC, Australia, and the Zonal Health Department, Sheka Zone, Masha, Ethiopia. Funding/Support: There was not funding/ financial support to the study. 1. Akessa GM, Tadesse M, Abebe G. Survival analysis of loss to follow-up treatment among tuberculosis patients at Jimma University Specialized Hospital, Jimma, Southwest Ethiopia. Int J Statistic Mechanic. 2015;2015:1-7. doi: 10.1155/2015/923025. 2. WHO. Global tuberculosis report 2017. Geneva; 2017. 3. WHO Africa. An epidemiological profile of HIV/AIDS, tuberculosis and Malaria in Sub-Saharan Africa. 2016. 4. Nájera-Ortiz JC, Sánchez-Pérez HJ, Ochoa-Díaz-López H, Leal-Fernández G, Navarro-Giné A. The poor survival among pulmonary tuberculosis patients in Chiapas, Mexico: The case of los altos region. Tuberculosis Res Treat. 2012;2012:1-6. doi: 10.1155/2012/708423. 5. WHO. Use of high burden country lists for TB by WHO in the post. 2015. 6. FMOH; EPHI. Implementation guideline for GeneXpert MTB/RIF assay in Ethiopia. 2014. 7. WHO . Global tuberculosis report 2015. Geneva, Switzerland: World Health Organization; 2015. 8. Eshetie S, Gizachew M, Dagnew M, Kumera G, Woldie H, Ambaw F, et al. Multidrug resistant tuberculosis in Ethiopian settings and its association with previous history of anti-tuberculosis treatment: A systematic review and meta-analysis. BMC Infect Dis. 2017;17(1):219. doi: 10.1186/s12879-017-2323-y. [PubMed: 28320336]. [PubMed Central: PMC5360058]. 9. EPHI. First Ethiopian National Population based tuberculosis prevalence survey. Addis Ababa, Ethiopia: Ethiopian Health and Nutrition Research Institute; 2011. 10. Dangisso MH, Datiko DG, Lindtjorn B. Trends of tuberculosis case notification and treatment outcomes in the Sidama Zone, southern Ethiopia: Ten-year retrospective trend analysis in urban-rural settings. PLoS One. 2014;9(12). e114225. doi: 10.1371/journal.pone.0114225. [PubMed: 25460363]. [PubMed Central: PMC4252125]. 11. Dangisso MH, Datiko DG, Lindtjorn B. Accessibility to tuberculosis control services and tuberculosis programme performance in southern Ethiopia. Glob Health Action. 2015;8:29443. doi: 10.3402/gha.v8.29443. [PubMed: 26593274]. [PubMed Central: PMC4655224]. 12. Datiko DG, Yassin MA, Chekol LT, Kabeto LE, Lindtjorn B. The rate of TB-HIV co-infection depends on the prevalence of HIV infection in a community. BMC Public Health. 2008;8:266. doi: 10.1186/1471-2458-8-266. [PubMed: 18667068]. [PubMed Central: PMC2542368]. 13. WHO. Stop TB initiative. Treatment of tuberculosis: Guidelines. Geneva, Switzerland: World Health Organization; 2010. 14. Eshetie S, Gizachew M, Alebel A, van Soolingen D. Tuberculosis treatment outcomes in Ethiopia from 2003 to 2016, and impact of HIV co-infection and prior drug exposure: A systematic review and meta-analysis. PLoS One. 2018;13(3). e0194675. doi: 10.1371/journal.pone.0194675. [PubMed: 29554144]. [PubMed Central: PMC5858841]. 15. Shaweno D, Worku A. Tuberculosis treatment survival of HIV positive TB patients on directly observed treatment short-course in Southern Ethiopia: A retrospective cohort study. BMC Res Notes. 2012;5:682. doi: 10.1186/1756-0500-5-682. [PubMed: 23234241]. [PubMed Central: PMC3585495]. 16. WHO. Global tuberculosis control. World Health Organization; 2001. 17. Shao Y, Yang D, Xu W, Lu W, Song H, Dai Y, et al. Epidemiology of anti-tuberculosis drug resistance in a chinese population: Current situation and challenges ahead. BMC Public Health. 2011;11(1):110. 18. Russell DG, Barry CE, Flynn JL. Tuberculosis: What we don’t know can, and does, hurt us. Sci. 2010;328(5980):852-6. 19. Orr P. Adherence to tuberculosis care in Canadian Aboriginal Populations, Part 2: A comprehensive approach to fostering adherent behaviour. Int J Circumpolar Health. 2011;70(2):128-40. doi: 10.3402/ijch.v70i2.17810. [PubMed: 21524358]. 20. Obermeyer Z, Abbott-Klafter J, Murray CJL. Has the DOTS strategy improved case finding or treatment success? An empirical assessment. PLoS One. 2008;3(3). e1721. doi: 10.1371/journal.pone.0001721. [PubMed: 18320042]. [PubMed Central: PMC2253827]. 21. Dye C, Floyd K, Uplekar M. "Global tuberculosis control: Surveillance planning financing" Who report. 2008. 22. WHO. Global tuberculosis control report. Geneva, Switzerland: World Health Organization; 2012. 23. WHO. Definitions and reporting framework for Tuberculosis. World Health Organization; 2013. 24. Federal Democratic Republic of Ethiopia Ministry of Health. Guidelines for clinical and programmatic management of TB, leprosy and TB/HIV in Ethiopia. Addis Ababa, Ethiopia: MOH; 2012. 25. Shaweno D, Shaweno T, Trauer JM, Denholm JT, McBryde ES. Heterogeneity of distribution of tuberculosis in Sheka Zone, Ethiopia: Drivers and temporal trends. Int J Tuberc Lung Dis. 2017;21(1):79-85. doi: 10.5588/ijtld.16.0325. [PubMed: 28157469]. 26. Ajagbe OB, Kabir Z, O'Connor T. Survival analysis of adult tuberculosis disease. PLoS One. 2014;9(11). e112838. doi: 10.1371/journal.pone.0112838. [PubMed: 25409024]. [PubMed Central: PMC4237371]. 27. Tachfouti N, Slama K, Berraho M, Elfakir S, Benjelloun MC, El Rhazi K, et al. Determinants of tuberculosis treatment default in Morocco: Results from a national cohort study. Pan Afr Med J. 2013;14:121. doi: 10.11604/pamj.2013.14.121.2335. [PubMed: 23734266]. [PubMed Central: PMC3670204]. 28. Birlie A, Tesfaw G, Dejene T, Woldemichael K. Time to death and associated factors among tuberculosis patients in Dangila Woreda, Northwest Ethiopia. PLoS One. 2015;10(12). e0144244. doi: 10.1371/journal.pone.0144244. [PubMed: 26669737]. [PubMed Central: PMC4687639]. 29. Reves R, Angelo S; CSIS. As Ethiopia moves towards elimination, success requires higher investment. Washington DC; 2016. 30. Berhe G, Enquselassie F, Aseffa A. Treatment outcome of smear-positive pulmonary tuberculosis patients in Tigray Region, Northern Ethiopia. BMC Public Health. 2012;12:537. doi: 10.1186/1471-2458-12-537. [PubMed: 22824524]. [PubMed Central: PMC3414747]. 31. Beza MG, Wubie MT, Teferi MD, Getahun YS, Bogale SM, Tefera SB. A five years tuberculosis treatment outcome at Kolla Diba Health Center, Dembia district, Northwest Ethiopia: A retrospective crosssectional analysis. J Infect Dis Ther. 2013;1:101. 32. Bao QS, Du YH, Lu CY. Treatment outcome of new pulmonary tuberculosis in Guangzhou, China 1993-2002: A register-based cohort study. BMC Public Health. 2007;7:344. doi: 10.1186/1471-2458-7-344. [PubMed: 18047661]. [PubMed Central: PMC2220000]. 33. Addis Z, Birhan W, Alemu A, Mulu A, Ayal G, Negash H. Treatment Outcome of Tuberculosis Patients in Azezo Health Center, North West Ethiopia. Int J Biomed Adv Res. 2013;4(3):167. doi: 10.7439/ijbar.v4i3.300. 34. Mugauri H, Shewade HD, Dlodlo RA, Hove S, Sibanda E. Bacteriologically confirmed pulmonary tuberculosis patients: Loss to follow-up, death and delay before treatment initiation in Bulawayo, Zimbabwe from 2012-2016. Int J Infect Dis. 2018;76:6-13. doi: 10.1016/j.ijid.2018.07.012. [PubMed: 30030177]. 35. Aibana O, Slavuckij A, Bachmaha M, Krasiuk V, Rybak N, Flanigan TP, et al. Patient predictors of poor drug sensitive tuberculosis treatment outcomes in Kyiv Oblast, Ukraine. Res. 2018;6. 36. FMOH. Tuberculosis progress report. Addis Ababa, Ethiopia; 2011. 37. Agbor AA, Bigna JJ, Billong SC, Tejiokem MC, Ekali GL, Plottel CS, et al. Factors associated with death during tuberculosis treatment of Patients co-infected with HIV at the Yaoundé Central Hospital, Cameroon: An 8-year hospital-based retrospective cohort study (2006–2013). PLoS One. 2014;9(12). e115211. doi: 10.1371/journal.pone.0115211. [PubMed: 25506830]. [PubMed Central: PMC4266669]. 38. Kigozi G, Heunis C, Chikobvu P, Botha S, van Rensburg D. Factors influencing treatment default among tuberculosis patients in a high burden province of South Africa. Int J Infect Dis. 2017;54:95-102. doi: 10.1016/j.ijid.2016.11.407. [PubMed: 27894985]. 39. Khan BJ, Kumar AMV, Stewart A, Khan NM, Selvaraj K, Fatima R, et al. Alarming rates of attrition among tuberculosis patients in public-private facilities in Lahore, Pakistan. Public Health Action. 2017;7(2):127-33. doi: 10.5588/pha.17.0001. [PubMed: 28695086]. [PubMed Central: PMC5493094]. 40. Pardeshi G. Survival analysis and risk factors for death in tuberculosis patients on directly observed treatment-short course. Indian J Med Sci. 2009;63(5):180-6. doi: 10.4103/0019-5359.53163. [PubMed: 19584488]. 41. Moolphate S, Aung MN, Nampaisan O, Nedsuwan S, Kantipong P, Suriyon N, et al. Time of highest tuberculosis death risk and associated factors: An observation of 12 years in Northern Thailand. Int J General Med. 2011;4:181. 42. Amuha MG, Kutyabami P, Kitutu FE, Odoi-Adome R, Kalyango JN. Non-adherence to anti-TB drugs among TB/HIV co-infected patients in Mbarara Hospital Uganda: Prevalence and associated factors. Africa Health Sci. 2009;9(2). 43. 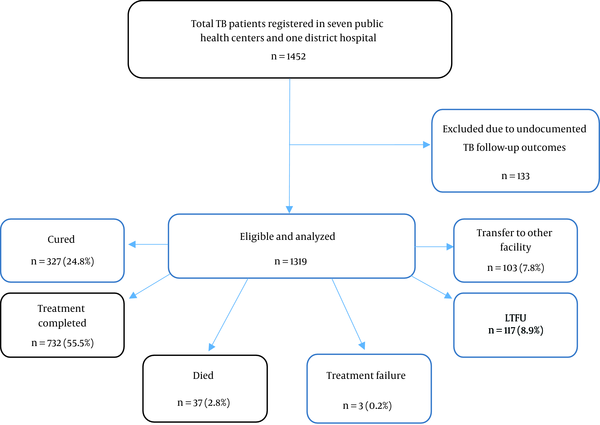 Tola HH, Tol A, Shojaeizadeh D, Garmaroudi G. Tuberculosis treatment non-adherence and lost to follow up among TB patients with or without HIV in developing countries: A systematic review. Iran J Public Health. 2015;44(1):1-11. [PubMed: 26060770]. [PubMed Central: PMC4449995]. 44. Yende-Zuma N, Naidoo K. The effect of timing of initiation of antiretroviral therapy on loss to follow-up in HIV-tuberculosis coinfected patients in South Africa: An open-label, randomized, controlled trial. J Acquir Immune Defic Syndr. 2016;72(4):430-6. doi: 10.1097/QAI.0000000000000995. [PubMed: 26990824]. [PubMed Central: PMC4927384]. 45. Herrero MB, Ramos S, Arrossi S. Determinants of non adherence to tuberculosis treatment in Argentina: Barriers related to access to treatment. Rev Bras Epidemiol. 2015;18(2):287-98. doi: 10.1590/1980-5497201500020001. [PubMed: 26083503]. 46. Gebremariam MK, Bjune GA, Frich JC. Barriers and facilitators of adherence to TB treatment in patients on concomitant TB and HIV treatment: A qualitative study. BMC Public Health. 2010;10:651. doi: 10.1186/1471-2458-10-651. [PubMed: 21029405]. [PubMed Central: PMC2978153]. 47. Tupasi TE, Garfin AM, Kurbatova EV, Mangan JM, Orillaza-Chi R, Naval LC, et al. Factors associated with loss to follow-up during treatment for multidrug-resistant tuberculosis, the Philippines, 2012-2014. Emerg Infect Dis. 2016;22(3):491-502. doi: 10.3201/eid2203.151788. [PubMed: 26889786]. [PubMed Central: PMC4766881].